French President Emmanuel Macron told a joint session of the U.S. Congress on Wednesday that France will not leave the Iran nuclear deal and urged Washington to remain committed to the agreement. During his address, Macron also vowed that “Iran shall never possess any nuclear weapons,” prompting loud applause from both Republicans and Democrats. Macron said that he and President Donald Trump should work on a “more comprehensive deal” addressing all of the concerns about the nuclear deal. The French president explained that four pillars should serve as the foundation for this plan: “the substance” of the existing nuclear deal; the JCPOA’s sunset clauses, key restrictions on Tehran’s nuclear program that are set to expire in about a decade; containing the Iranian regime’s military influence in the Middle East; and monitoring Iran’s ballistic-missile program. France was a party to the nuclear deal, which it, the U.S. under the Obama administration, and four other world powers struck with Iran in 2015. The deal curbs Iran’s nuclear program in exchange for sanctions relief. Although, according to Germany, every state has the right to choose its own capital, it doesn’t extend the same courtesy to Israel. Germany is refusing to recognize Jerusalem as Israel’s capital. Indeed, while its foreign ministry acknowledged that every country has the right to name its own capital, it said that this is not the case for Israel, insisting that the status of Jerusalem can be settled only through negotiations with the Palestinians. “As a matter of principle, every state has the right to determine a city in its territory to be its capital,” Niels Annen, a minister of state in Germany’s Foreign Ministry, said in response to a query by a lawmaker from the far-right Alternative for Germany (AfD) party last week, The Times of Israel reported. “Since the eastern part of Jerusalem that Israel occupied in 1967 contrary to international law is not part of Israel’s sovereign territory, the international community, including Germany, has not recognized this declaration,” he added. He based his position on the 1980 United Nations Security Council’s (UNSC) Resolution 478, which proclaimed that Israel’s declaration on united Jerusalem being its capital “constitutes a violation of international law,” as well as on clauses for the 1995 Oslo Peace Accords. “The federal government shares the view that the status of Jerusalem, just like other final status issues, can only be settled through negotiations to be durable and acceptable,” Annen affirmed. Germany’s Chancellor Angela Merkel similarly stated, in an interview with Israel’s Channel 10, that Berlin will not move its embassy in Israel from Tel Aviv to Jerusalem. Since Trump’s announcement in December that the US recognizes Jerusalem as the Israeli capital and will move its embassy there, a number of countries have followed suit. Bystron said he was “amazed that, even 70 years after the founding of the State of Israel, the German government has no idea what its capital is.” He was especially surprised, he said, that Foreign Minister Heiko Maas, who had just visited Jerusalem and emphasized Germany’s “special responsibility for, and solidarity with, the democratic, Jewish state of Israel,” was unwilling to support Israel’s position. “Considering the special responsibility the German government keeps emphasizing it has toward Israel, it is strange they keep repeating the arguments of Israel’s enemies,” Bystron said. Following passage of the Taylor Force Act, which requires the Palestinian government to stop these payments or face a full cutoff in aid, the lawmakers are seeking to immediately freeze U.S. aid to the Palestinians until the State Department explains to lawmakers how it plans to enforce the new law. The letter follows a recent Free Beacon report disclosing that the Palestinian Authority continues to spend U.S. aid dollars on terrorists. Palestinian officials have also made clear that they have no intention of following the new law and will continue to provide terrorists and their familiar with compensation. Lawmakers are additionally requesting information on what measures the administration is “planning to take to enforce the law and suspend aid to the PA, given the above statements and the content of their proposed budget?” according to the letter, which is addressed to secretary of state nominee Mike Pompeo. The State Department is required to report to Congress this week on its implementation of the Taylor Force Act and explain what efforts it is taking to stop Palestinian payments to terrorists. Asked about the state of play on Wednesday, a State Department official declined to provide information on the reporting requirement and further information showing the Palestinian government continues to provide salaries to terrorists. Organizations tracking the Palestinian media recently disclosed that the PA is slated to spend at least eight percent of its 2018 budget on its so-called martyr’s fund. That figure amounts to about $355 million, according to Palestinian Media Watch. Palestinian President Mahmoud Abbas, in a recent speech, outlined his intention to continue paying terrorists, a point highlighted by the lawmakers in their letter to Pompeo. The lawmakers go on to request the Trump administration require the Palestinians to abandon this practice as a pre-condition for peace talks with Israel. Other members of Congress are lining up behind the effort as well. The mountain’s collapse, and the prospect of radioactive exposure in the aftermath, confirms a series of exclusive reports by the South China Morning Post on China’s fears that Pyongyang’s latest nuclear test had caused a fallout leak. Radioactive dust could escape through holes or cracks in the damaged mountain, the scientists said. North Korea saw the mountain as an ideal location for underground nuclear experiments because of its elevation – it stood more than 2,100 metres (6,888 feet) above sea level – and its terrain of thick, gentle slopes that seemed capable of resisting structural damage. The mountain’s surface had shown no visible damage after four underground nuclear tests before 2017. But the 100-kilotonne bomb that went off on September 3 vaporised surrounding rocks with unprecedented heat and opened a space that was up to 200 metres (656 feet) in diameter, according to a statement posted on the Wen team’s website on Monday. As shock waves tore through and loosened more rocks, a large section of the mountain’s ridge, less than half a kilometre (0.3 mile) from the peak, slipped down into the empty pocket created by the blast, leaving a scar visible in satellite images. Wen concluded that the mountain had collapsed after analysing data collected from nearly 2,000 seismic stations. Three small earthquakes that hit nearby regions in the wake of the collapse added credence to his conclusion, suggesting the test site had lost its geological stability. Another research team led by Liu Junqing at the Jilin Earthquake Agency with the China Earthquake Administration in Changchun reached similar conclusions to the Wen team. 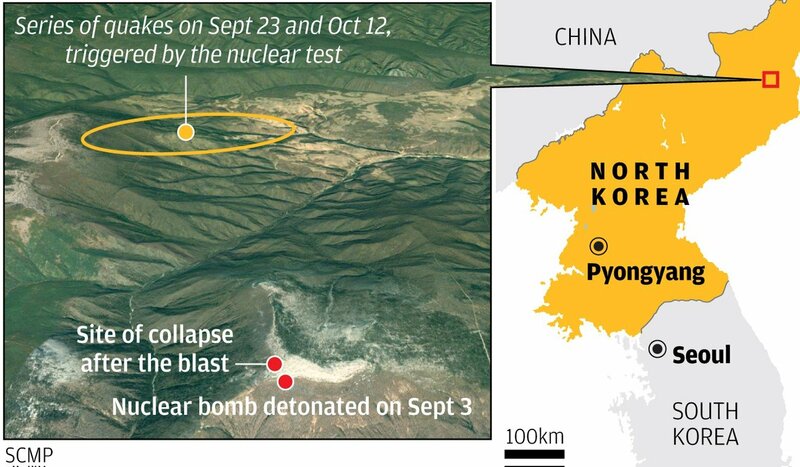 The “rock collapse … was for the first time documented in North Korea’s test site,” Liu’s team wrote in a paper published last month in Geophysical Research Letters. The breakdown not only took off part of the mountain’s summit but also created a “chimney” that could allow fallout to rise from the blast centre into the air, they said. Zhao Lianfeng, a researcher with the Institute of Earth Science at the Chinese Academy of Sciences in Beijing, said the two studies supported a consensus among scientists that “the site was wrecked” beyond repair. Speculation grew that North Korea’s site was in trouble when Lee Doh-sik, the top North Korean geologist, visited Zhao’s institute about two weeks after the test and met privately with senior Chinese government geologists. Although the purpose of Lee’s visit was not disclosed, two days later Pyongyang announced it would no longer conduct land-based nuclear tests. Hu Xingdou, a Beijing-based scholar who follows North Korea’s nuclear programme, said it was highly likely that Pyongyang had received a stark warning from Beijing. “The test was not only destabilising the site but increasing the risk of eruption of the Changbai Mountain,” a large, active volcano at China-Korean border, said Hu, who asked that his university affiliation not be disclosed for this article because of the topic’s sensitivity. The mountain’s collapse has likely dealt a huge blow to North Korea’s nuclear programme, Hu said. Zhao Guodong, a government nuclear waste confinement specialist at the University of South China, said that the North Korean government should allow scientists from China and other countries to enter the test site and evaluate the damage. A senior Iranian official said on Tuesday that Tehran may withdraw from the nuclear non-proliferation treaty (NPT) if President Donald Trump scraps the Joint Comprehensive Plan of Action (JCPOA), or Iran nuclear deal. Iran has been party to the NPT since 1970. “This is one of three options that we are considering,” Ali Shamkhani, the secretary of Iran’s Supreme National Security Council, said about the possibility that Iran will withdraw from the NPT if Trump dismantles the nuclear Iran deal. 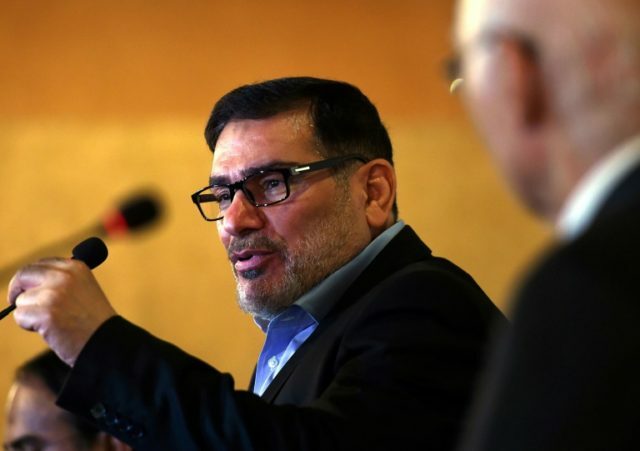 According to Reuters, Shamkhani made the statement during a news conference broadcast on state television and also stated that the Atomic Energy Organization of Iran was ready for some “surprising actions” if the nuclear deal was scrapped. French President Emmanuel Macron arrived in Washington, DC, on Monday in a last-ditch attempt to keep America in the JCPOA. During the press conference, Trump warned Iran against restarting its nuclear program. “You’ll find out about that. It won’t be so easy for them to restart. They’re not going to be restarting anything. They restart it, they’re going to have big problems, bigger than they’ve ever had before,” Trump said. US and Israeli intelligence officials are concerned over a number of cargo flights that have flown from Iran to Syria in recent weeks, CNN reportedon Wednesday. A US administration official confirmed to the network that the US and Israel fear the planes are being used to transport weapons for troops loyal to Syrian President Bashar Assad or Iranian forces operating in the country, which could then be used to attack Israel. Although there have been shipments from Iran to Syria in the past, these recent flights were said to have been noted as they arrived in the wake of the April 13 US-led strikes on Syrian military targets in response to an alleged chemical gas attack on the town of Douma that killed dozens. 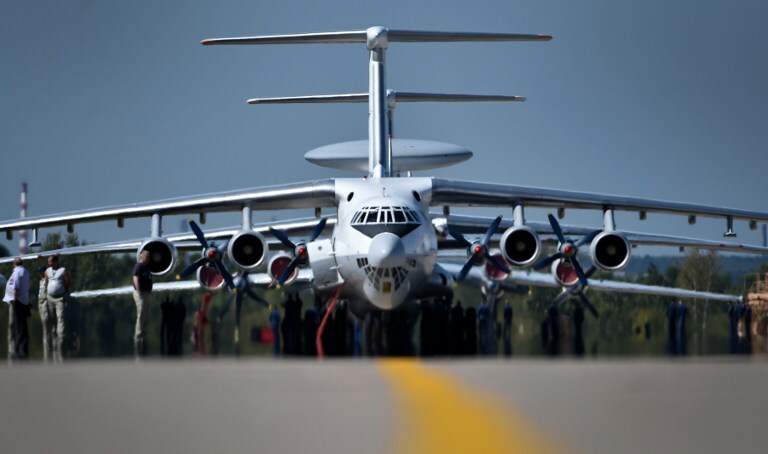 A Twitter account tracking air traffic around the world recently published details of at least two Syrian Air Force IL-76 cargo flights between Iran and Syria, and the US official told CNN that other flights including at least one Iranian cargo plane have also been monitored by intelligence services. The news network also reported concerns that the transports were replenishing anti-aircraft missiles depleted when Syria targeted Israeli jets carrying out a raid in February. Israel carried out strikes on targets in Syria after an explosives-laden drone was flown into Israeli airspace on February 10. The Israeli military said at the time that between one-third and one-half of Syria’s air defenses were destroyed during the strikes. During a Syrian counterattack against the Israeli jets, one F-16 was hit by anti-aircraft fire and crashed in a field in northern Israel after the pilot and navigator ejected from it. Western officials have accused Iran of using seemingly civilian airlines as fronts for the Iranian Revolutionary Guard Corps to conduct military transport missions to Syria from Tehran’s Mehrabad Airport. Pouya Airlines, for instance, was subjected to US sanctions in 2014 for “transporting illicit cargo, including weapons, to Iran’s clients in the Levant,” according to the US Treasury Department. Over time, the IRGC began setting up its own facilities on Syrian military bases and air fields. Reported Iranian attempts to bring advanced weaponry into Syria come at a time of unprecedented tension between Jerusalem and Tehran, including mutual threats of attack. 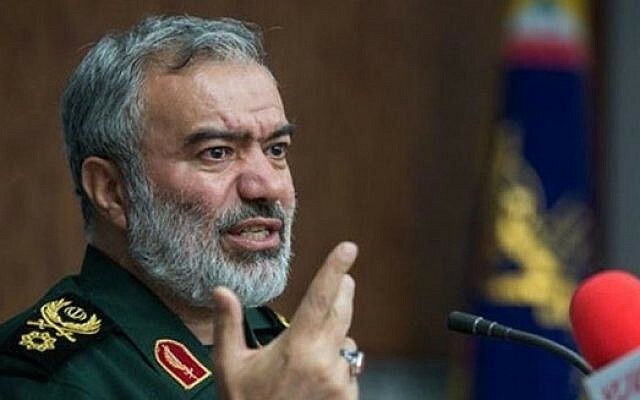 Most recently, Iran has vowed revenge over an airstrike on the T-4 airbase in Syria in April that was said to have killed several Iranian military figures and has widely been blamed on Israel, which has not confirmed it was behind it. 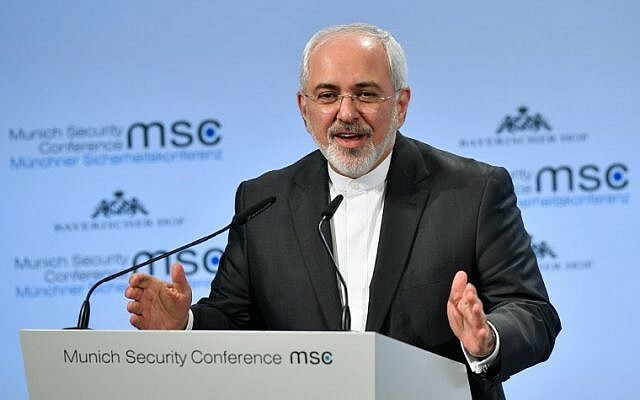 The secretary of Iran’s Supreme National Security Council said Tuesday that Tehran “will choose the time and place” to mete out its “inevitable” response for the strike on the T-4 base. “The entity that gives itself the right to attack the sovereignty of another country and to target forces fighting terrorism must certainly have thought about the results and consequences of that attack and the corresponding reaction,” Ali Shamkhani told reporters. Shamkhani’s words came days after the IDF released a map showing five Iranian-controlled bases in Syria that would apparently constitute potential targets for an Israeli response should Iran carry out any kind of attack. Iran has access to a variety of surface-to-surface missiles, from short-range Fajr-5 rockets to medium-range Fateh 110 missiles, which have a range of approximately 300 kilometers (190 miles) to long-range Shehab ballistic missiles capable of hitting targets over 1,300 kilometers (800 miles) away. To counter those threats, Israel has a multi-tiered missile defense system consisting of the Iron Dome for short-range rockets and mortar shells, the David’s Sling for medium-range missiles and the Arrow for long-range ballistic missiles.